So far Storm has saved a village from a tsunami and fought an old nemesis, so what's next for this heroine? In Storm #3, Grek Pak keeps us a little more grounded by introducing an old flame and playing up a romantic love interest angle. Not only this, but it all takes place somewhere a little more native to Storm: Kenya. The setting is great as it allows artists Scott Hepburn and Rachelle Rosenberg to incorporate an earthy feel and color to this issue. Hepburn is a new penciller, who along with David Baldeon is filling in for Victor Ibanez. 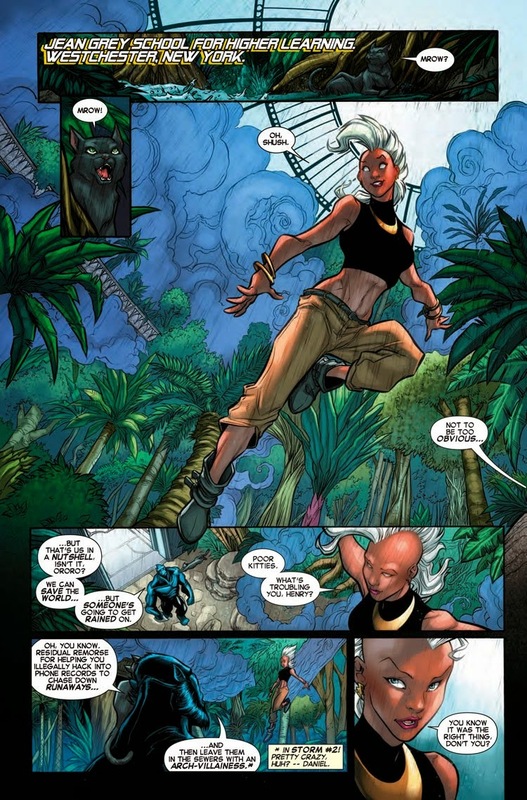 Throughout the series thus far, Pak has been true to his word about exploring the inner workings of Storm as a character. Make no mistake about it, this is a heavily character-driven issue as a result. Pak is delving into who Storm is and showcasing what makes her tick by examining the various important roles and relationships intertwined with the character. There are moments throughout Storm #3 when it feels emotional and awkward, as it should. 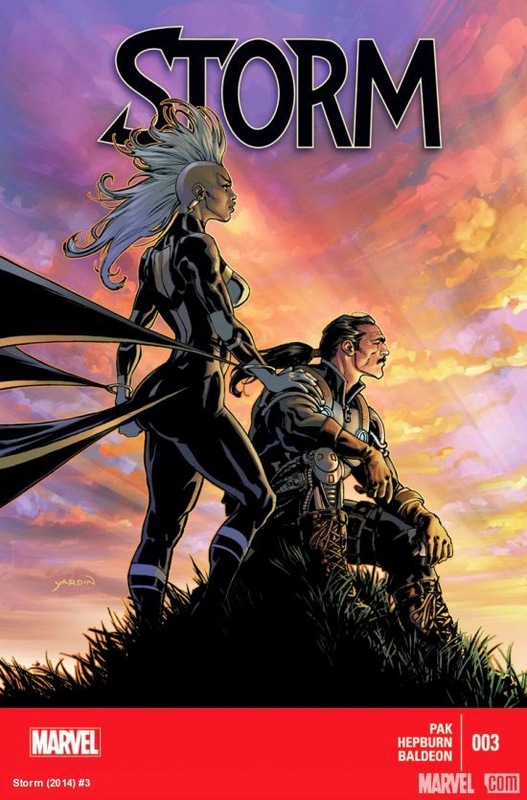 If you empathize with Storm or Forge and their situation, it is natural to feel such a way when reading this issue, and as a writer I suspect that this is what Pak wants you to do—to invest in the story. Scott Hepburn's splash page for Storm #3. Given this, don't expect too much action in Storm #3. It is that type of issue. Pak is displaying a broad range of the spectrum that makes up Storm, and this issue is focused on her ability to be thoughtful, nurturing, and to foster relationships. As we lead into the aftermath of the Death of Wolverine series, this issue brings to the forefront an emotionalism which is sure to be ramped up in the next issue and made raw as a result of the intimate connection between Storm and Wolverine. The art by Hepburn and Rosenberg continues the elemental feel established already in the series. Hepburn's style is clearly different to Ibanez's, but is complementary nonetheless. An aspect of this issue that stands out is the panel arrangement; Hepburn uses a less rigid form of panel presentation to tell the story with slightly more overlays and singlet character depictions without boarders. The flow of the story as a result is not as methodical and suits Pak's narrative. 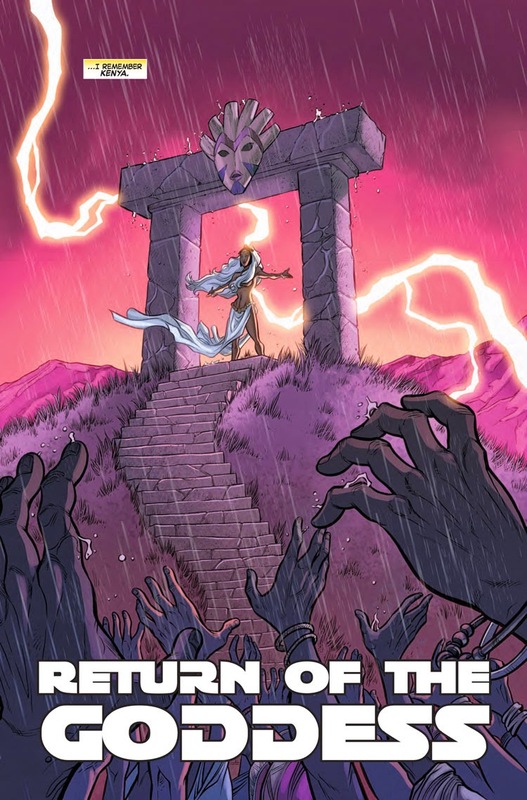 Rosenberg brings a less gritty feel to the coloring on Storm #3, and this seems appropriate given the change of setting from the New York suburbs and underground of last issue to the plains of Africa. The sense of nature is positive and upbeat with a vibrant use of color to reflect this. Rosenberg's colors do well to highlight the different style Hepburn is bringing to this issue. Rachelle Rosenberg's colors are vibrant. We are witnessing a building momentum on Storm that loosely interacts with other X-Men characters and stories. The focus here really has been on Storm so far, but I get the sense that this will change as we move through the Death of Wolverine and into AXIS. While the focus will not necessarily shift from the titular character, Pak will have to incorporate more of the ramifications of these events into the overall narrative. Despite this, the series is building along nicely and it will be fascinating to see where we are taken to down the path that Storm chooses to pave. What did you think of Storm #3 and the series so far? How do you think Storm will handle the death of Wolverine? Let us know your thoughts and leave a comment below.